Continuing on, “Operation: get myself into swimsuit shape” is in full effect. It was Saturday afternoon and I was having huge cravings for something greasy. French fries are delicious, but quickly disappear in my presence, so I brainstormed ways to get rid of my craving. Dustin and I went to a restaurant the week before called, “Topolobampo” by Rick Bayless and they served us raw jicama slices instead of chips with our guacamole. That got me thinking, “Maybe I can use the jicama root instead of fries…and…what goes better with fries than a burger? I’m trying to be more organized as I cook these days, so I separated and chopped all my ingredients before hand. 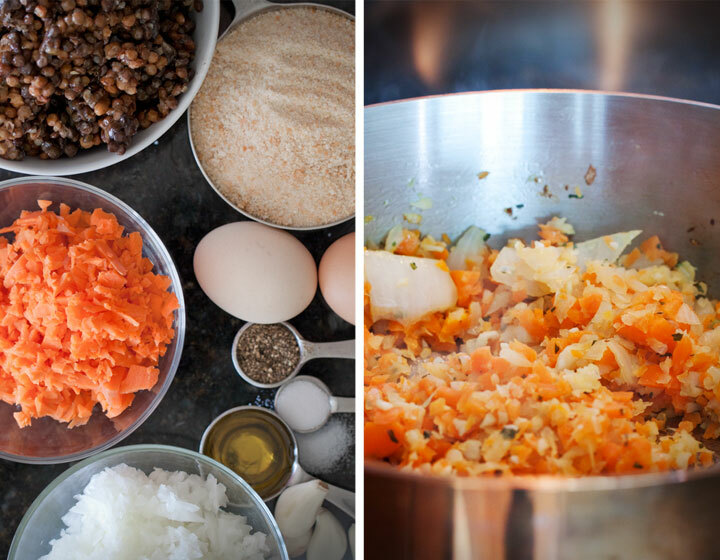 I used precooked lentils, which will save you some cooking time if you want to try this one, and used my food processor to chop the garlic, onions, and carrots. I wanted my burger to have a nice texture and taste, so I sauteed the veggies until they were soft and slightly brown. I then combined the sauteed veggies with eggs, bread crumbs, salt, pepper, and soy sauce in a bowl. I wanted to mix everything up by hand since I knew I was going to have to get my hands dirty a step or two later anyway. After it was all mixed together I started to form my patties. Around that same time, I put a little olive oil in a pan and and let it warm up. I fried the patties on both sides until they were brown. I’ve had veggie burgers that just crumble as you eat them, which I really don’t like, but these guys stuck together really well. Finally, I dressed my lentil burger with sliced onions, tomatoes, lettuce and cheese. 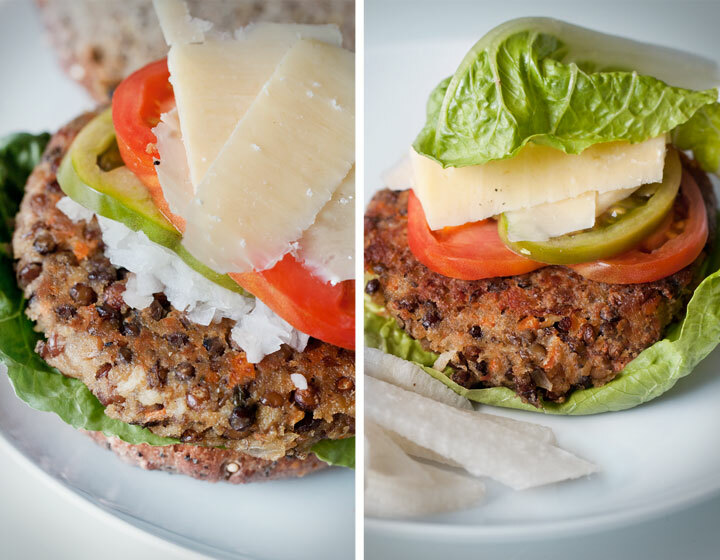 I served Dustin’s burger with the traditional wheat bun, but decided to be more of health nut and eat my lentil burger with lettuce in place of the bun. I think it was just as good that way, but I did cheat a little and use ketchup. It’s the Nebraskan in me. The final touch to the dish was what actually gave me the idea to make lentil burgers in the first place, raw jicama slices that I topped with guacamole. 1. Chop carrots, onions and garlic in a food processor. 2. Saute the chopped veggies in pan with olive oil. 3. Combine eggs, bread crumbs, salt, pepper, soy sauce, and fried veggies in a bowl. Mix all the ingredients with your hands. 5. Put a small amount of oil in a pan and fry the patties for 2-3 minutes on each side, until brown. 6. Dress your burger with toppings of your choice and use either a bun or lettuce (instead of a bun). 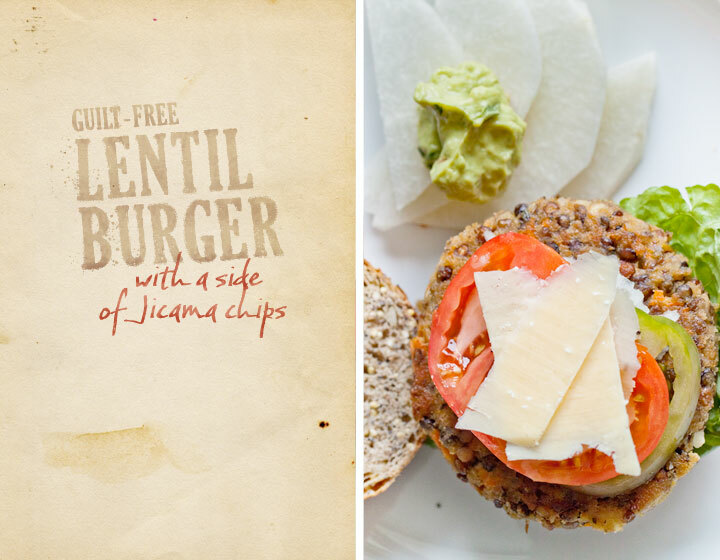 § 4 Responses to Guilt-Free Lentil Burger"
I like that you are so creative when it comes to making new dishes. It looks good. I would sure try it. And you know… I’m a burger girl married to a meat man. I recommend it. The worst thing is when you get a veggie burger that just falls apart and this recipe does a good job of keeping everything together. Dustin is a meat man too and really liked this recipe. 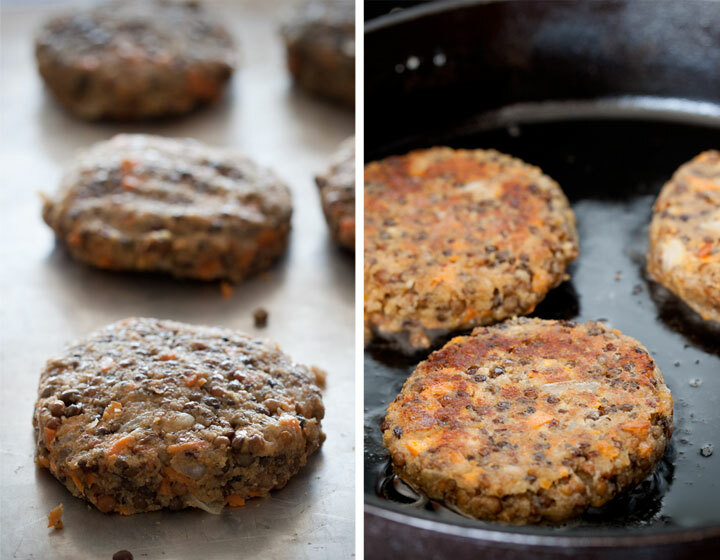 I will have to try this lentil burger this weekend! I may add a bit more salt next time I make this, but other than that it was perfect for what I was craving. Highly recommended.